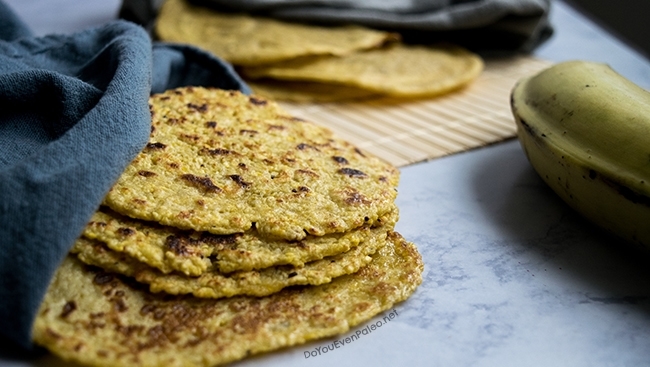 Add Plantain Tortillas to the long list of overdue recipes here at Do You Even Paleo. Since I first tried plantains, I’ve professed how much I love them. I’ve made plantain patties, plantain muffins, plantain cake, plantain beef bowls, and more. These starchy veggies are so incredibly versatile…it’s hard not to love them. 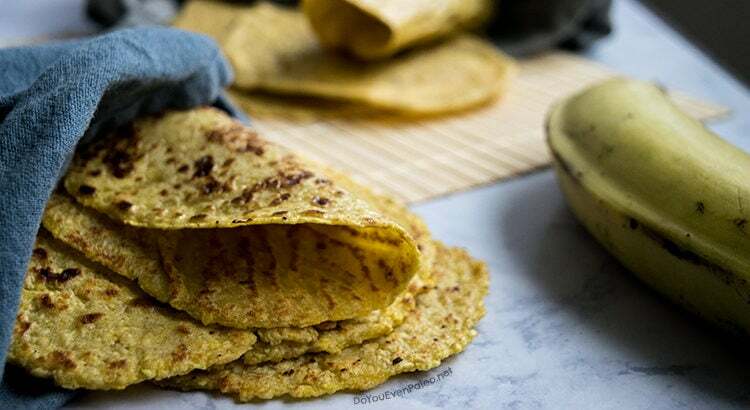 I’ve made plantain tortillas numerous times over the past few years, and I finally took the time to write down my favorite ways to make them. 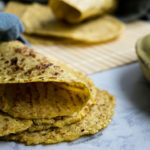 Both of these methods do take a little prep time, but tacos with these tortillas are so freaking good…you won’t regret it! The first method (below, left) uses just plantains and a little salt. You then press out the tortillas like you would flour-based tortillas, using either a tortilla press or a rolling pin. This technique works best with green plantains. You’re going to need zip-top baggies for this method. Just trust me. Parchment paper will not work—the dough sticks to everything! In my eyes, the second method (above, right) is for those times when your plantains got a little too ripe. They’re not totally green anymore and are a bit yellow instead. The first method doesn’t work as well in this situation. Instead we’re going to blend the plantains with a binder (eggs) and ghee, then bake them. Yes, you can use green plantains for this method, too…I just prefer the simple plantain + salt combo in that case. The blend and bake method is my backup (since I can’t always get green plantains at the one store in Fargo that carries them). Either way, you end up with perfectly bendable tortillas. Excellent vehicles for taco cravings! If you end up with too many tortillas, you can save them in the fridge. Just make sure you reheat them before using or they’ll crack. I typically microwave mine for about 7 seconds (but you can use a skillet to reheat them if that’s your thing, too). 3/7/17 Note: If you try using plantains that have just turned yellow for the stovetop method (like I did) and you find that they’re just tooooooo sticky, try sprinkling the ziptop bag with arrowroot powder. That will help prevent sticking, so you can easily peel away the tortillas. 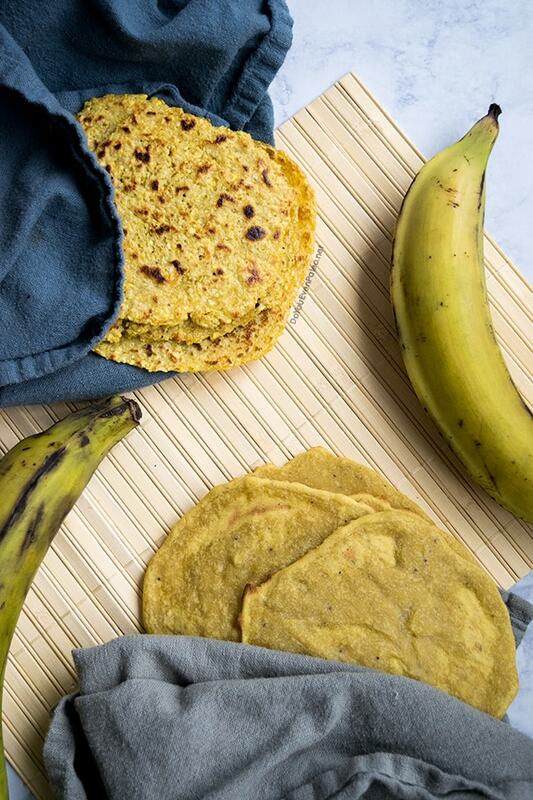 Unfortunately, they still won’t make as great of tortillas as green plantains would, but they’re usable! For me, they puffed up like naan bread when cooking. I might try to develop that into a different recipe! Cut the ends of the plantains and slice the peel vertically down the length of the plantain (this makes it easier to peel them later). Slice the plantain horizontally into 4-5 large chunks. Set a large pot of water over high heat and add plantains. Bring to a boil, cooking for about 15 minutes until the flesh of the plantains can easily be pierced with a fork. Drain the plantains. Remove peels (they should come off easily now) and drop into a blender with the salt. 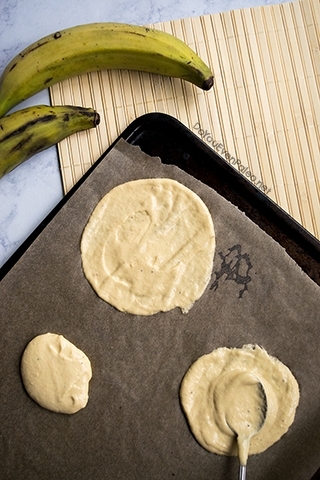 Blend on medium speed until the plantains come together in a ball of dough. Form the dough into 4-5 balls. The dough is very sticky! One at a time, place each dough ball between plastic (like from a zip-top bag) and roll out with a rolling pin (or press with a tortilla press). Heat a well-seasoned cast iron skillet over medium heat. 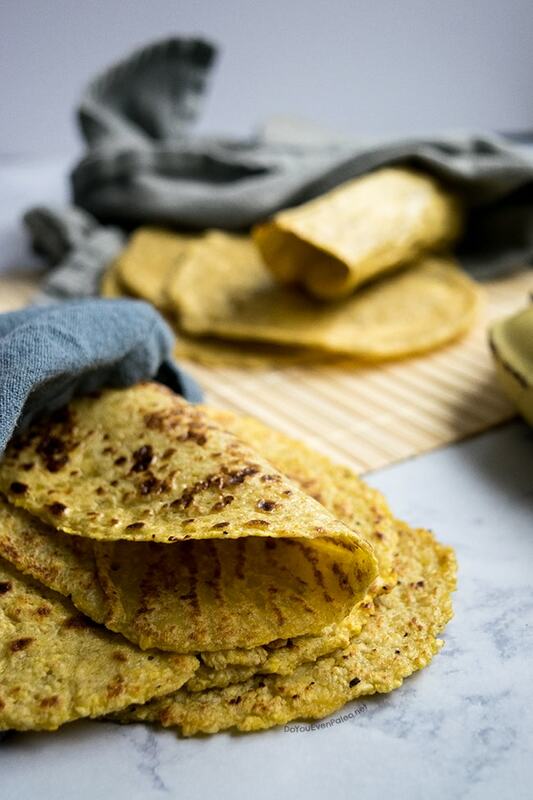 Cook each tortilla for 1-2 minutes on each side or until browned. Serve immediately or store in an airtight container in the fridge, reheating before use. Cut the ends off the plantains and slice the peel vertically down the length of the plantain (this makes it easier to peel them). Slice the plantain horizontally into 4-5 large chunks. Remove the peels. 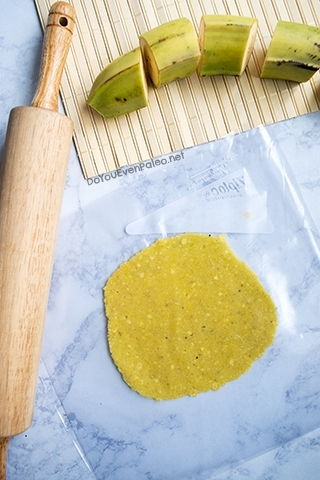 Add the plantain chunks, egg, ghee, apple cider vinegar, and sea salt to a high-speed blender. Blend, starting on low and gradually increasing to high, until the mixture is completely smooth. Using a large spoon or cookie scoop, drop a heaping spoonful of the batter onto the lined baking sheet. Use the back of the spoon (or your finger) to spread the batter out in a circular motion, making it as thin as you can. Repeat until the baking sheet is filled (I can usually only fit 4 or 5 tortillas per baking sheet). Bake for 8 minutes, then remove from the oven. This recipe makes about 12 tortillas. Use immediately or store in an airtight container in the fridge, reheating before use. Je ne parle malheureusement pas anglais. J’habite à Bruxelles et je suis ouest-africaine. Mais je tenais à vous dire que votre blog est magnifique de bonnes idées. Toutes ces recettes sur les bananes plantains m’ont époustouflées. Bravo ! Don't subscribe All Replies to my comments Notify me of followup comments via e-mail. You can also <a href='https://www.doyouevenpaleo.net/comment-subscriptions/?srp=2298&srk=87505361eee98908ddf6ccb8681f50d6&sra=s&srsrc=f'>subscribe</a> without commenting.